Occasionally, I browse through sites like Etsy and eBay for vintage glassware and the older Avon bottles--figural, animals, etc. I am fairly certain this love of glassware began with my Grandma D. Grandma lived just a few blocks from us in a very small town, and we were allowed to walk over and visit her at a young age, even having to cross one of the main streets. Nowadays, I'm not sure if parents are a little more watchful of their young kids, but anyone who grew up in Wheatley in the 70's knows how small a town that was, and just how non-busy Erie street was. Grandma's house was like a treasure box, always something more to find. She had colourful glass vases and goblets lining the windows they could line, and adorning the bookshelves in her front room, dressers and anywhere else that needed a pick-me-up. I remember on top of her television she had a balloon couple, I believe they were Royal Doulton. Occasionally, Grandma would let us go up to the attic and look around and through boxes that were stored up there. What treasures! Old workbooks from when my father was younger, some clothes, some glassware, and a certain kind of magic that if I close my eyes now and picture the attic, I can still feel. Once we moved to a town about a half hour away, visits were fewer and farther between. But, there were times I stayed with Grandma for a few days. One day, we went 'yard sale-ing'. There was a house on one of the backroads in between Wheatley and Leamington, and I can't remember anything else that was out for sale, but there was one piece that caught my eye. 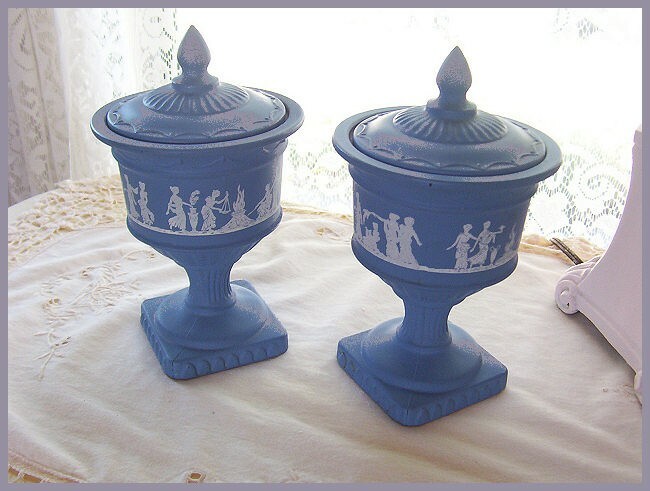 A blue wedgewood looking candle holder with a lid, complete with the old Moonwind scented candle inside. I picked it up, looked it over and just had to have the piece. It did have a very small chip on the inside of the lid, but I loved it anyway. This was the beginning of my Avon collection. My grandmother passed away in the mid 80's, but to this day, I still visit her house in my dreams, always looking for something but never really finding it. In my most recent window shopping, I came across a shop with a listing for a pair of these holders, minus the candles, on Etsy. I just had to make these mine and contacted the seller, who replied quickly and is willing to ship these to Canada for me. The picture is property of debster222 and is used here with her permission.